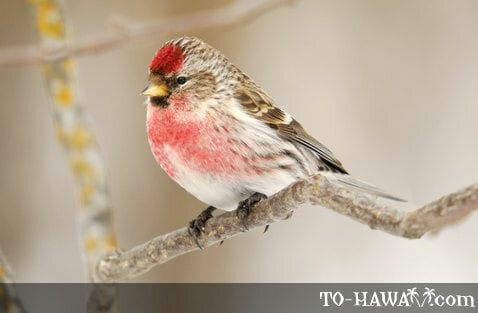 The common redpoll belongs to the family of finches. Its habitat is in shrubs and thickets. Adult makes have a bright red crown, a black chin, black-brown wings and tail, and a red or pink cheek and breast. Its flanks have lines of dark streaks. Adult females look similar to males, but are darker and streakier. Their bodies show little or no red, except on their crown.